다시래기는 진도지방에서 초상이 났을 때, 특히 타고난 수명을 다 누리며 행복하게 살다 죽은 사람의 초상일 경우 동네 상여꾼들이 상제를 위로하고 죽은 자의 극락왕생을 축원하기 위해 전문예능인들을 불러 함께 밤을 지새우면서 노는 민속극적 성격이 짙은 상여놀이이다. 놀이의 정확한 유래는 알 수 없으나 고구려의 옛 무덤에서 보여지는 벽화와 고구려·신라의 역사를 기록한 사서를 통해 오랜 옛날부터 장례에서 가무가 행해졌음을 알 수 있다. 진도다시래기는 다섯마당으로 이루어져 있다. 첫째마당은 가상제놀이로 가짜 상제가 나와 상여꾼들과 농담을 주고 받는다. 둘째마당은 봉사인 거사와 사당 그리고 중이 나와 노는데, 진도다시래기의 중심굿으로 민속가면극에서의 파계승 마당에 해당된다. 셋째마당은 상여꾼들이 빈 상여를 메고 만가를 부르는데 다른 지역의 상여소리와 달리 씻김굿의 무당노래가 중심을 이루고 있다. 넷째마당은 묘를 쓰며 부르는 가래소리를 하면서 흙을 파는 시늉을 한다. 다섯째마당은 여흥놀이로 이어져 예능인들은 후한 대접을 받는다. 진도다시래기는 우리나라에서 유일하게 장례 때 무당단체인 신청(神廳)을 중심으로 조직된 당골 전문예능인들에 의해 전승된 민속극으로 장례풍속과 민속극 연구에 중요한 가치를 지니고 있다. 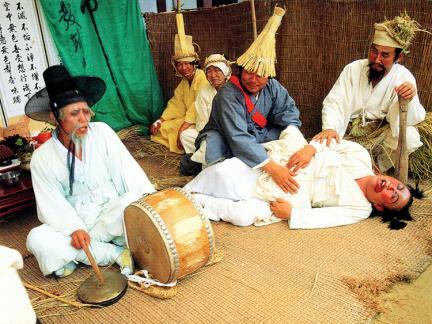 When a person died on Jindo Island after a long life, villagers came to console the bereaved family and had professional entertainers perform all night, which was part of the custom of praying for the peace of the spirit of the dead. Dasiraegi is a term referring to this custom. 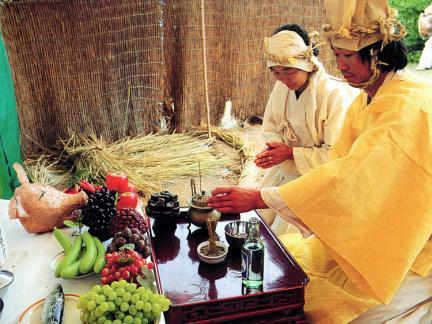 Goguryeo (circa 37 BC – 668 AD) tomb murals and books on the history of Goguryeo and Silla (57 BC – AD 935) show that people sang and danced during the funeral period. 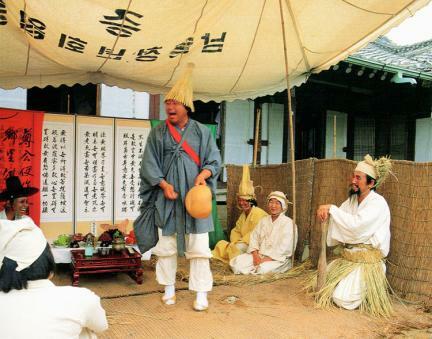 Jindo Dasiraegi is composed of five acts. In Act I, a person pretending to be a member of the bereaved family exchanges jokes with mourners. 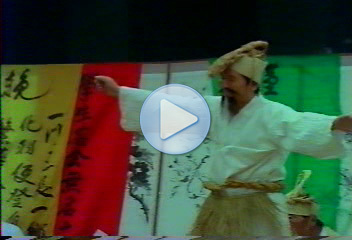 In Act II, a blind man, a female member of the troupe and a monk engage in a round of play. In Act III, mourners carry an empty bier on their shoulders and sing a funeral song. In Act IV, the mourners assume an act of digging a tomb, while singing a song. In the final Act, food and liquor are served to the invited entertainers. 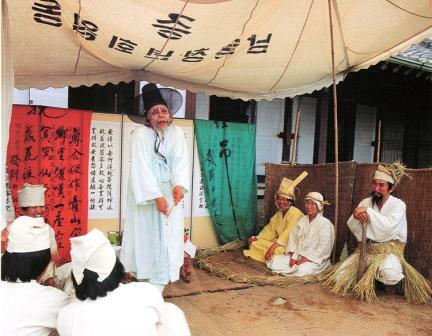 Jindo Dasiraegi is the country’s only folk play performed during a funeral period and handed down among professional entertainers belonging to Sincheong (an organization of exorcists and music performers). 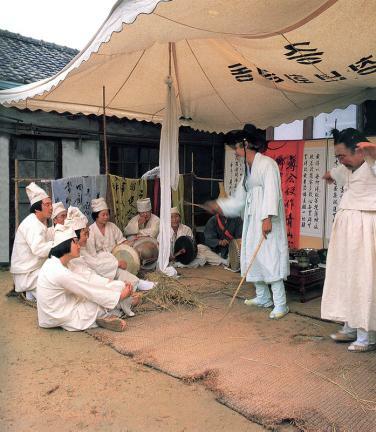 It is a valuable source of material for those studying funeral customs and folk plays.